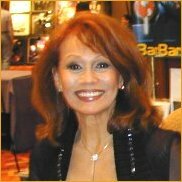 Official BarBara Luna Website - What's New? 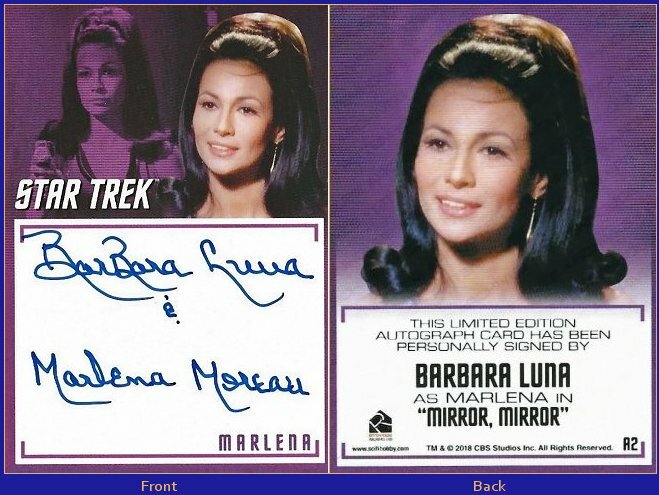 Just released from RITTENHOUSE is my new 2018 Classic Star Trek trading card from "Mirror Mirror" personally signed by me and Marlena Moreau! Hi Friends: If you're not up to date on this fifteen minute fan run spoof called "Superseven", please click on the link to see what I was coaxed out of retirement to do and had great fun doing! "Superseven" began filming two years ago and has won several awards. Written, directed and created by Robert Griffith a.k.a. Scott Rhodes. "Operation: Destructo". 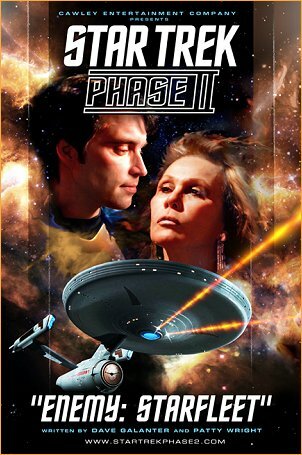 Watch for the "Enemy: Starfleet" segment of the Internet's "Star Trek: Phase II". Luna is presently featured in the September/October issue of Daeida Magazine. Follow Luna's journey from the Broadway stage to a career that weathered scandalous headlines and found enduring success in film & television. This issue has 5 full-page images, one gorgeous centerfold, and an 8-page in-depth interview. The entire story will be available online on October 5th, but right now the intro and all the new images Luna took exclusively for Daeida are active on the site. There's also a promo poster available (pictured) of the centerfold, plus the other four images that are full page photos in the actual magazine. It is sharp, clear and printed on the same smooth movie poster paper that the magazine is printed on. Same size: 11x17. The poster is free with the purchase of the magazine issue she's in. It will be folded down the middle and mailed with the actual magazine. Or, the poster may be purchased separately for $10 each (U.S.price) or $20 each (outside the U.S.) (both prices include shipping & handling) and it will be rolled in a tube and mailed First Class to anywhere in the world. More information available at www.daeida.com. Ever since Star Trek Enterprise brought back the Mirror Universe with the popular “In a Mirror, Darkly” in 2005, the alternative place with the beards has been all the rage. Pocket Books has released a couple Mirror Universe books with more on the way and IDW recently announced a Mirror comic, and now Diamond Select is headed to the other side. DST recently announced that their popular Star Trek Minimates line continues this summer with a set based on the episode “Mirror Mirror.” The new set from DST will be the first time they have offered a boxed set of Trek Minimates. 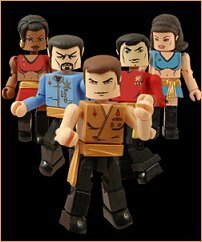 The set will include Mirror Universe versions of Captain Kirk, Mr. Spock, Sulu, Uhura, and Marlena Moreau. 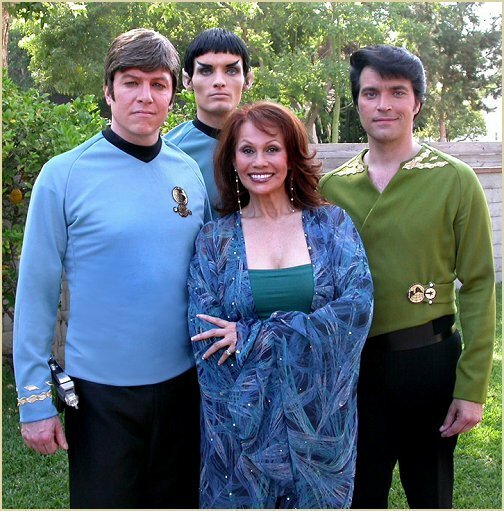 Original "Star Trek" series guest star BarBara Luna returns to "Star Trek: Phase ll" (formerly called "New Voyages") in the upcoming episode, "Enemy: Starfleet", written by veteran Trek author Dave Galanter. In a recent interview regarding the New Voyages TV Guide Online Award win, James Cawley commented, "We are still casting the guest stars, but I can confirm that BarBara Luna will be traveling to New York to fill one of the guest spots." Luna, who played Lt. Marlena Moreau in the original series episode "Mirror, Mirror," also guest starred in New Voyages' first episode, "In Harm's Way." "Although BarBara was in a previous episode, that was much more of a cameo appearance, rather than a starring role that will feature her skills as an actor", said Cawley. "I can't say what character she will play just yet, there is still so much about this episode we want to keep under wraps until we get closer to production this spring." "Enemy: Starfleet" will be filmed both at the famous Vasquez Rocks in California and at the Retro Films Studio in Upstate New York. See the write-up. Marlena Moreau beaming down for San Diego! Diamond Select Toys is pleased to announce the addition of a fifth “Mirror, Mirror” action figure, available only at this summer’s San Diego Comic-Con . A limited Marlena Moreau figure sculpted by Art Asylum will be available exclusively at the Diamond Select Toys booth! 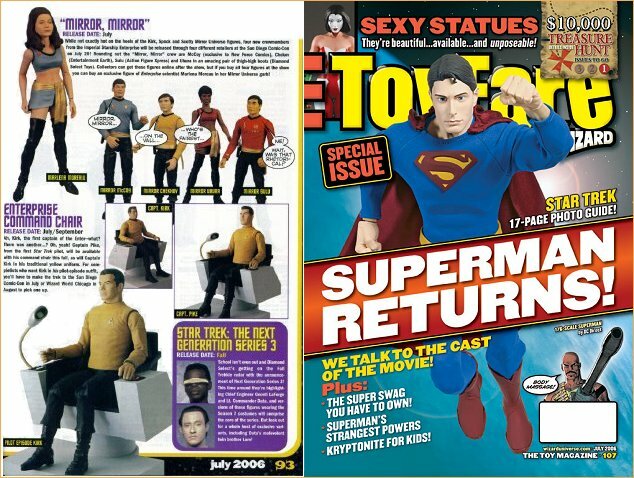 From Classic Trek to TNG to Enterprise, pictures and prices for every Star Trek figure in Art Asylum and Diamond Select's 6- and 7-inch toy lines are featured in the July issue of ToyFare Magazine, #107. In an upcoming two-part episode titled, "In A Mirror, Darkly", the Enterprise, in an alternate universe, meet people they encountered in the past, but in different capacities. "In a Mirror, Darkly" is a prequel to Luna's "Mirror, Mirror" episode, it's just too bad that they didn't think to ask her to be a part of it. Be sure to tune in! On another note, after four seasons, Star Trek: Enterprise recently finished production and their last show will air in May. If you'd like to be part of the campaign to bring STE back, visit the Save Enterprise website. Also, feel free to post your thoughts in Luna's Guestbook. Star Trek: New Voyages is a non-profit production, available at www.NewVoyages.com. The show is created entirely by fans out of a love for Star Trek and is not affiliated with Paramount Pictures. “In Harm’s Way” is the second episode of the series, which features special guest performances by Star Trek alumni BarBara Luna and Malachi Throne, among others. The original Star Trek series was created by Gene Roddenberry in 1966, but was cancelled after three years on the air. The dedicated fans gave it new life through conventions and fan-written fiction in self-published newsletters and magazines, until Paramount Pictures released “Star Trek: The Motion Picture” in 1979. The franchise has since spawned nine more films and four new television series. Cow Creek Films and Star Trek: New Voyages are in no way associated with Viacom International, Inc., Paramount Pictures, United Paramount Network, or their affiliates.